Many people believe a dog is a dog is a dog. Despite the huge variations in size and shape, the physiology of all dogs is basically the same but that’s where the similarities end. 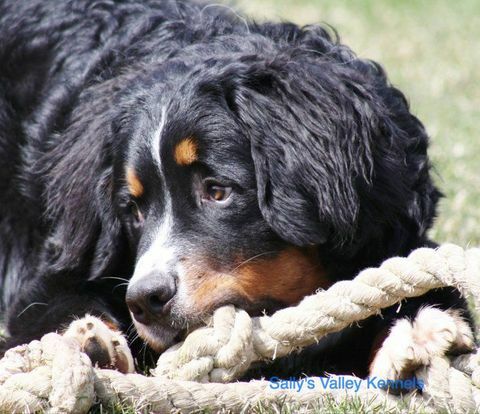 We have a Breed Standard which sets out what the ideal Bernese Mountain Dog should be like, but even that carefully thought out description falls far short of describing what the Bernese that we actually HAVE are REALLY like! I am sure that owners of every breed think their breed is unique, but I suspect that Bernese are even more unique than many of us expected! Having owned and worked with dogs of varying breeds all of my life, I have found Bernese to be particularly peculiar (in the nicest possible way!) because they are a complex mix of so many traits. Bred as a general-purpose farm dog, Bernese do not exhibit one strong, over-riding trait (unlike herders with an enhanced hunt/chase instinct etc or the carry/retrieve nature of some gundogs). Selectively bred to fulfil various jobs around the farmyard, Bernese were created to work alongside their master and so they are generally happy to comply with their masters wishes. But don’t be fooled – some Bernese have a stubborn streak too and they take great delight in testing their owner’s power of leadership and control whilst reminding their owners (often all-too-regularly!) that the 40+kilos of this particular tri-coloured dog has a mind of his own too. This big, powerful breed is sturdily built, broadly set and heavy and their physical strength cannot be denied. The extreme growth rate from a half kilo newborn to a massive 40+kilos at around a year old requires a robustness to cope with the stresses and strains of such extreme physical development. Anyone standing in the path of a strong, vigorous but fast-moving Bernese will bear the bruises of just how robust they are compared to us mere mortals! Unfortunately, many owners are ill-prepared when a seemingly insignificant bump or knock to their Bernese renders a degree of lameness far in excess of what we might expect for such a large strong looking dog. Even minor illness and injury and common complaints such as ear and skin problems, digestive upsets etc. can be a heavier burden to a Bernese compared to some smaller, slighter-built breeds who seem to cope better. Bernese are completely devoted to their owners and portray the classic image of the ultimate faithful canine companion. They put their owners on a pedestal and the love and respect they have for their “leader” cannot be denied. Bernese are very ‘tuned in’ to people and body language, they are ‘people watchers’ extraordinaire from a surprisingly young age; puppies arriving at their new homes at around 7 or 8 weeks will already have memorised the lessons their mother gave them on “How to manipulate humans” and these young innocents are more than capable of recognising and exploiting our weaknesses and inconsistencies. Bernese puppies have a cuteness factor second-to-none plus all the basic skills required to ensure we shower them with affection, meet their every need (and whim!) and grant them privileges which may encourage routine behaviour in our beloved pet which we live to regret but can’t possibly withdraw. Bernese are renowned for having an easy-going nature. They don’t need huge amounts of daily exercise, they are fairly straight-forward to groom and don’t cost a fortune to feed. Bernese do not need a huge amount of space, they are more than happy to live in our houses and ‘bunk down’ in our beds with us (!) and they will even fit into a small car. Bernese definitely seem accommodating in those respects – but that doesn’t give any warning to the HUGE demands they make of you and your time. Bernese crave attention- they need attention - they will do ANYTHING to get your attention – and there is no way that you can ignore their unrelenting demands! A Bernese wants to be with his master above all else, following you around, leaning up against you and watching you and listening for you all the time. Living with a Bernese is like having a child hanging on your apron strings – they never let you go. Tall and proud and beautiful, Bernese have an air of dignity and superiority about them. Adult Bernese can exhibit some rather regal traits such as being reluctant to step in puddles or drink from a bowl that another dog has spat in. Some even refuse to jump up into the cargo area of the car – preferring to have their owners lift them in, first the front legs then their back legs, and then they stand there waiting for you to arrange a comfortable spot for them! Cut glass beauty and cut glass mannerisms - all wrapped into one classy package - Doggy Dignity at its finest. Unfortunately, when it suits them (and without warning) the façade will disappear and you are subjected to humiliation for no better reason than your Bernese decided to amuse himself and play the clown (often at your expense!) Bernese do daft things and lose all sense of decorum; they pull funny faces and have a whole catalogue of silly expressions; they throw themselves down on the floor with all the grace of a demolished, collapsing building, then roll on their back with their legs wide open (as if they have been steam-rolled) and display all their 'bits' whilst sporting a devilish grin (especially when the vicar calls); they pretend they don’t understand when you call “come here” and just as you tell folk what a lovely well-mannered dog he is, he will take a flying leap and knock you to the ground and then adorn you with muddy footprints on your best clothes. And he does it just for fun. With their beauty and their almost human-like catalogue of expressions, how could we fail to be endeared by Bernese? Their very nature invites our affection and demands our indulgence, we were bound to be caught under their spell. Lovable, affectionate, amusing, entertaining, Bernese seem to have all the qualities to capture the heart and invade the life of any dog lover. Even though we willingly devote ourselves to our beloved Bernese, they cause great frustration at times! Just when we think everything is going according to OUR plan, they put a spanner in the works! As they progress through puppyhood we swing from elation at how well they compare to the Breed Standard, only to despair at the ‘ugly duckling’ that appeared overnight. When we pride ourselves at how fit and well our Bernese is, he starts to limp for no apparent reason. When he is in tip-top form in readiness to appear at a long awaited and important function/show, we awake on the big day to find the house looking like an explosion in a mattress factory with all the hair on the floor and none on the dog. AND…………just when we think we have his measure – when we think we know what makes him 'tick' and have him all 'sussed' out – he does something completely new or out of character and totally baffles us. 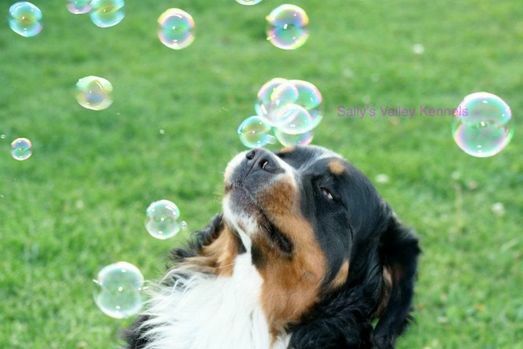 Frustration is a regular emotion experienced by Bernese owners.